The report describes the lack of affordable housing and the prevalence of the problem nationwide. 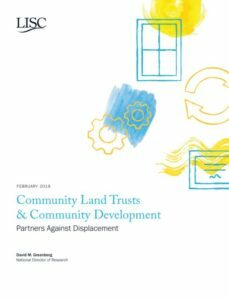 Community Land Trusts (CLTs) are proposed as a common solution to the problem, though they are often on the small scale. Proposals within the report are made to scale-up CLT effectiveness by partnering with Community Development Corporations (CDCs). Several examples of partnerships—many of which are supported by LISC—include: investments, leveraging the CDC infrastructure to support CLTs, and policy mobilization. Municipal to federal support of land trust policy to institutionalize affordable housing options along with development is also discussed.